If you love to solve clueless crosswords, you've come to the right place! We've got thousands and thousands of unique clueless crosswords ready and waiting to be solved. Feel free to play casually as a guest, or, if you're a more competitive sort, register a free account and be automatically entered in each of our monthly solving competitions! What is a Clueless Crossword? 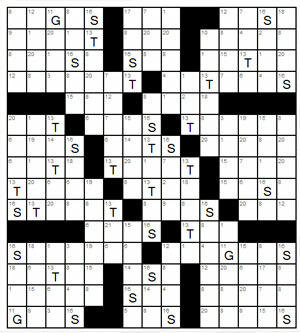 A clueless crossword is in many ways very similar to a regular crossword. It consists of a grid of black and white squares, and the player must enter valid words or terms into the white squares so that all words going across and down are valid. Unlike a regular crossword, there are no clues for each word. To fill in the grid, you must associate each number on the grid with the letter it represents - all 3's, for example, might be E's, and all 12's might be T's. For more information, check out our Frequently Asked Questions. Or, if you're ready to start playing, click here to solve your first puzzle! What is the 3rd letter in comb?